In 1995, the Metropolitan Museum of Art mounted a controversial exhibition entitled “Rembrandt/Not Rembrandt,” in which works considered to be genuine Rembrandts were displayed alongside those done by his students and admirers. (These lesser paintings are often dismissed as “the school of Rembrandt.”) The point of the exhibition was to reveal the fine line between genius and imitation, authenticity and fakery. A hundred years ago, about 700 works were attributed to Rembrandt. Over the course of the 20th century, that number declined by 50 percent, as critics and historians began searching for those tell-tale marks that distinguish the old master from his young pupils. Such critical distinctions have massive financial consequences: while a painting by celebrated Rembrandt pupil William Drost might sell for a few hundred thousand dollars – his best canvases can go for a couple million – a genuine Rembrandt is worth many times more. 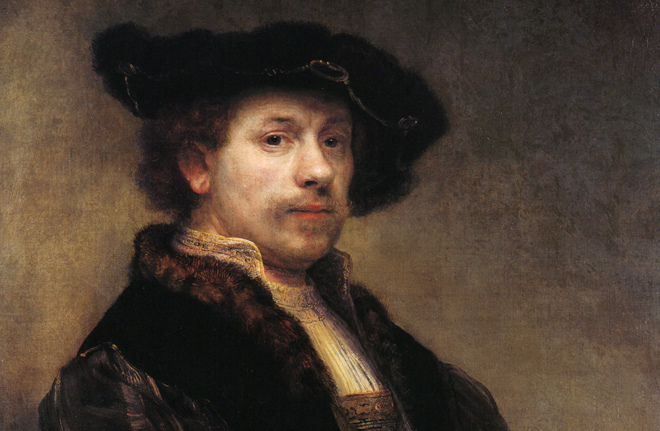 In 2009, a lesser Rembrandt portrait sold for $33 million. What accounts for this staggering difference in value? One possibility, of course, is that there’s something inherently special about a real Rembrandt, that the Dutch painter filled his art with discernible flourishes that can be detected by observers. Although we might not be able to explain these minor differences, we still appreciate them at an unconscious level, which is why we hang Rembrandts in the Met and consign his imitators to the basement. Great art is not an accident. The second possibility is that our aesthetic judgements are really complicated. While Rembrandt was an astonishingly talented artist, our response to his art is conditioned by all sorts of variables that have nothing to do with oil paint. Many of these variables are capable of distorting our perceptions, so that we imagine differences that don’t actually exist; the verdict of art history warps what we see. The power of a Rembrant, in other words, is inseparable from the fact that it’s a Rembrandt. The man is a potent brand. In this experiment you will see a sequence of 50 Rembrandt paintings. Before each image appears, an audio prompt will announce whether the upcoming painting is ‘authentic’ or a ‘copy’ (Please see background for further information on copies). A blank screen will appear for a few seconds after each image to allow you to relax your gaze. The first thing the researchers discovered is that there was no detectable difference in the response of visual areas to Rembrandt and “school of Rembrant” works of art. The key word in that sentence is “detectable”: fMRI remains a crude tool, and just because it can’t pinpoint a significant difference between groups (especially given these limited sample sizes) doesn’t mean there is none. That said, it’s not exactly surprising that such similar paintings would elicit virtually identical sensory responses. It takes years of training before critics can reliably discern real Rembrants from copies. And even then there is often extensive disagreement, as the 1995 Metropolitan show demonstrates. However, the scientists did locate a pattern of activity that appeared whenever a painting was deemed to be authentic, regardless of whether or not it was actually “real.” In such instances, subjects showed a spike in activity in the orbitofrontal cortex, a chunk of brain just behind the eyes that is often associated with perceptions of reward, pleasure and monetary gain. 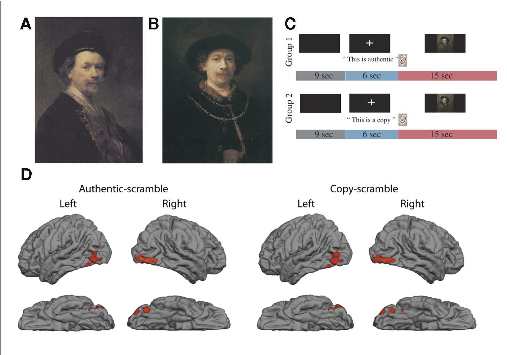 (According to the scientists, this activation reflects “the increase in the perceived value of the artwork.”) Interestingly, there was no difference in orbitofrontal response when the stamp of authenticity was applied to a fake Rembrandt, as the brain area responded just as robustly. The quality of art seemed to be irrelevant. These lessons don’t just apply to the evaluation of art. In fact, the same mental process also appears to drive our appreciation of expensive wine. In both instances, the sensory differences on display – say, the visual distinction between a real and fake Rembrandt, or the taste of Trader Joes Pinot versus a Romanee-Conti – are overwhelmed by our cognitive beliefs about what we’re experiencing. Consider this recent experiment led by neuroeconomists at Caltech. Twenty people sampled five Cabernet Sauvignons that were distinguished solely by their retail price, with bottles ranging from $5 to $90. Although the people were told that all five wines were different, the scientists weren’t telling the truth: there were only three different wines. This meant that the same wines would often reappear, but with different price labels. For example, the first wine offered during the tasting – it was a cheap bottle of Californian Cabernet – was labeled both as a $5 wine (it’s actual retail price) and as a $45 dollar wine, a 900 percent markup. All of the red wines were sipped inside an fMRI machine. Not surprisingly, the subjects consistently reported that the more expensive wines tasted better. They preferred the $90 bottle to the $10 bottle, and thought the $45 Cabernet was far superior to the $5 plonk. By conducting the wine tasting inside an fMRI machine – the drinks were sipped via a network of plastic tubes – the scientists could see how the brains of the subjects responded to the different wines. While a variety of brain regions were activated during the experiment, only one brain region seemed to respond to the price of the wine, rather than the wine itself: the orbitofrontal cortex. In general, more expensive wines made this part of the brain more excited. The scientists argue that the activity of this region shifted the preferences of the wine tasters, so that the $90 Cabernet seemed to taste better than the $35 Cabernet, even though they were actually the same wine. We want to believe that pleasure is simple, that our delight in a fine painting or bottle of wine is due entirely to the thing itself. But that’s not the way reality works. Whenever we experience anything, that experience is shaped by factors and beliefs that are not visible on the canvas or present in the glass. Even the most exquisite works in the world – and what is more exceptional than a Rembrandt portrait? – still require a little mental help. We only see the beauty because we are looking for it.